‘Dyslexia and Creativity: An Academic Perspective’ is the first in a series to investigate under-researched areas of dyslexia. It has come from a need to investigate a much quoted but little researched and substantiated area of dyslexia, namely positive attributes or talents that have come out of having a learning disability. Whilst traditional understanding of creativity is solely concerned with the arts, wider investigation suggests it includes many other careers, from cooking to sport, business to politics. Thus creativity can be seen is all areas of society. As dyslexia is traditionally perceived to be a disability affecting reading and writing, many imagine that dyslexics are unable to attain in our word-based society. However many have, and these include world leaders and celebrities, in a range of areas. So how can they be dyslexic and attain to such high standards? What is that they have, in addition to their difficulties that allow them to reach international success? One explanation is that dyslexics develop compensation skills as a reaction to their difficulties; another suggests that the dyslexic brain is neurologically different, and a third sees dyslexics as part of the next stage in human evolution, with superior abilities for our modern age. However research to date has been unable to support the claim that dyslexics are creative or have visual-spatial talents in excess of the normal population. Thus this book aims to shed light on the issue, through three types of perspectives: (1) Academic Perspectives; (2) Personal Perspectives; and (3) Alternative Perspectives. 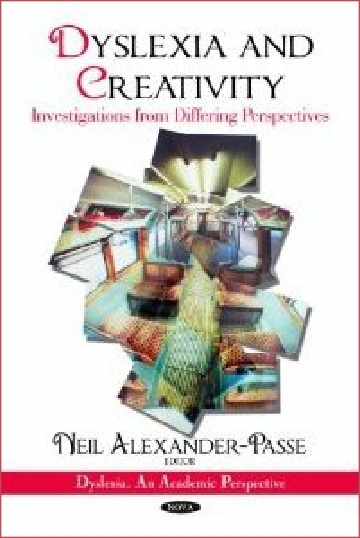 ‘Dyslexia and Creativity: An Academic Perspective’ is the collection of seventeen perspectives, from authors and artists from the US, UK, Sweden and Australia, which aim to enlighten the reader to new academic research, personal views of dyslexic artists, and an investigative interview study challenging dyslexic artists to ‘what makes the dyslexic artist unique’. ‘Dyslexia and Creativity: An Academic Perspective’ is an ideal reference book for researchers, educators, artists, and dyslexics who seek understanding of their creative abilities. 2.4 Artistic talents and dyslexia: a genuine connection? 3.6 Approaching dyslexia sideways – is it a blessing or a curse? 3.7 How do practicing creative visual artists, who are dyslexic, approach thinking and learning in the process of their work?